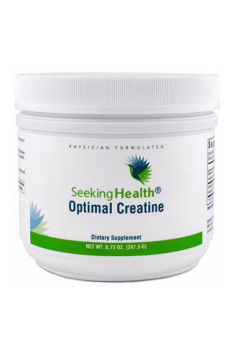 Seeking Health Optimal Creatine is a dietary supplement in a powder form which contains a complex of two active substances per serving (500mg of creatine and 88 mg of magnesium). They are constituent of Creatine MagnaPower®, a patented, cutting-edge magnesium creatine chelate with extremely high bioavailability. The supplement comes with a metal scoop which allows you to measure the right dose of the supplement. The product helps maintain normal energy levels in muscle tissue while contributing to an increase in exercise capacity. Regular use of the preparation helps do high intensity training and stimulates the growth of muscle tissue. It is a perfect solution for endurance athletes who expect fast and effective regeneration of the essential ATP, but not only that. Numerous studies show a beneficial impact of creatine on the nervous, cardiovascular and skeletal system. Creatine is protein occurring naturally in the body which is produced in the liver and consists of 3 amino acids – arginine, glycine and methionine. Creatine may be found in natural products, mainly red meat and fish. However, the content of creatine in these products is too low for athletes, even when consumed in large amounts. Because of that it is necessary to take highly absorbable supplements. Magnesium is a very important element to the human body. It has an impact on most bodily processes. Its deficiency may lead to dangerous health consequences. Magnesium is usually associated with the nervous system because it has a sedative and relaxing effect. However, the element promotes also healthy functioning of other systems. It is used to regulate over 300 biochemical reactions, including many processes of energy production. Magnesium supplementation may also help achieve better athletic performance by, among others, promoting erythropoiesis and maintaining normal haemoglobin levels. Creatine Magna Power®, creatine magnesium chelate in this supplement, is a cutting-edge and most stable form of creatine on the market. An advanced formula protects the creatine molecule from converting into inactive creatinine and causes that higher amounts of the active substance reach its target areas which are muscle cells. The main role in this complex is played by magnesium which decreases the acidic environment of creatine (a low environmental ph promotes the conversion of creatine into creatinine) and helps keep its highly active both when we prepare the product for consumption and after it reaches the digestive tract. However, it is mistakenly assumed that taking these substances in separate supplements will increase absorption because many studies demonstrate that such combination does not produce the desired results. Creatine is phosphorylated to phosphocreatine in the body. It is a high-energy compound which supports muscles during intense activity. This compound has a key role in the production of adenosine triphosphate (ATP) which is a basic source of energy for the working muscles. Intense physical activity leads to the breakdown of ATP into ADP with the release of energy. This is the moment when phosphocreatine comes in handy which helps regenerate the ATP molecule through rephosphorylation. Creatine supplementation helps thus maintain optimal ATP levels. Because of that, you can do more reps which will have a direct impact on the effectiveness of your workout. Creatine helps stimulate the growth of muscle tissue. This results from, among others, increased water permeability through cell membranes. Firstly, water is an environment in which all metaboli processes take place (including anabolism). Secondly, creatine promotes adequate hydration of a muscle cell and thus increases its size. Furthermore, it has been shown that creatine may contribute to a decrease in the activity of myostatin, a protein which prevents the overgrowth of muscle tissue. Supplementing with phosphocreatine, which is the combination of creatine with phosphate, may reduce lactic acid build-up in muscles which occurs often after a long, hard workout. It is decreased by buffering hydronium ions. Benefits of creatine supplementation are enormous and valued by every athlete who has ever tried this kind of training support. Nonetheless, taking highly bioavaiable creatine, which is undoubtedly Creatine Magna Power, may be beneficial not only to athletes. Plenty of studies have found many other advantages of its regular use. High excitotoxicity due to glutamate is one of the factors that degenerate nerve cells and causes neurological disorders . This is due to the increased influx of calcium ions into the cell, which may be inhibited to some extent by ATP. As already metioned, creatine functions as a store of ATP, thereby decreasing neurotoxicity. Normal development of osteoblasts (bone-forming cells) requires the proper activity of creatine kinase. Studies show that increased exposure of osteoblasts to creatine helps increase their growth and improve mineralisation. Nowadays, depression is one of the most common mental disorders. When energy metabolism in the brain is impaired, it may lead to the development of this disease and its symptoms. Creatine may improve considerably energy balance and thus help combat symptoms of depression. To sum up, Seeking Health Optimal Creatine is a dietary supplement with high absorption, designed both for athletes (who want to increase lean body mass and improve considerably their training performance) and those who struggle with depression and skeletal disorders. Mix 1 scoop in a small amount of water. To achieve better results faster, add beta-alanine and caffeine to your supplementation regimen. During creatine supplementation, maintain increased water intake. Your daily fluid intake should include at least 1 l of pure water. Magnesium taurate in tablets. Regulates cardiac contractility and supports cardiovascular function.